Gilder Lehrman Collection #: GLC07334.03.02 Author/Creator: Schultz, John N. (fl. 1875) Place Written: s.l. Type: Document signed Date: 15 January 1875 Pagination: 2 p. ; 28 x 21.5 cm. Summary of Content: Signed by Chaplain Schultz as a witness. 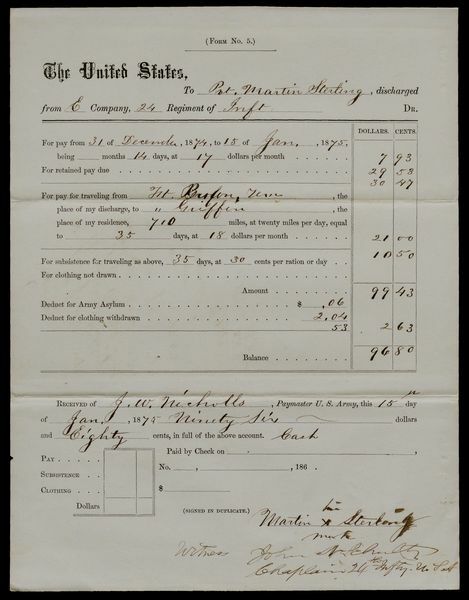 Lists the amount of pay received by Private Sterling, an African American serving in Company E, 24th Infantry Regiment. States that pay was received from J. W. Nicholls, United States Paymaster. An "x" signifies Sterling's signature.